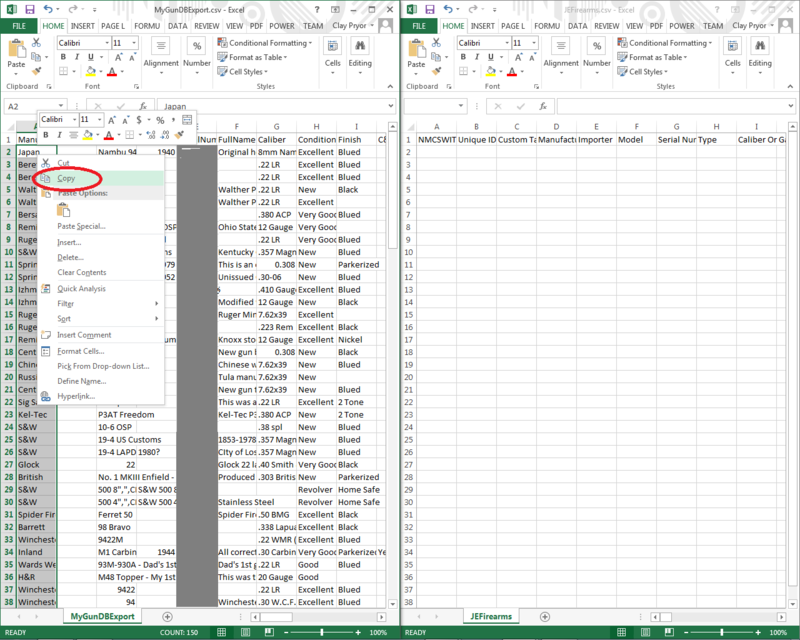 I have been asked if spreadsheet data can be migrated into NM Collector Software. The answer is "yes," with a little reformatting of data. Please see the following instructions with screen captures for key steps in the process. 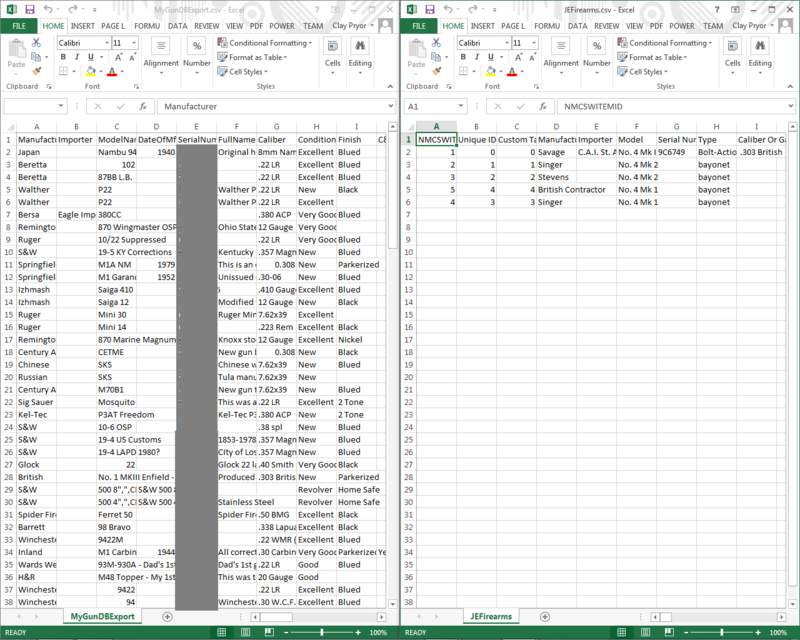 This example uses a spreadsheet for a gun collection. The same steps can be used for any type of collection. 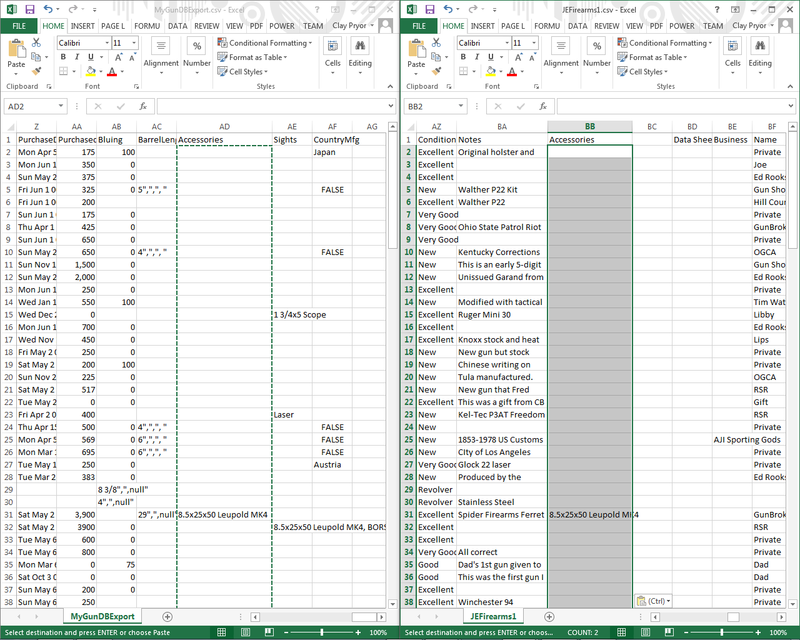 The items are ordered in the treeview according to the order in the spreadsheet. 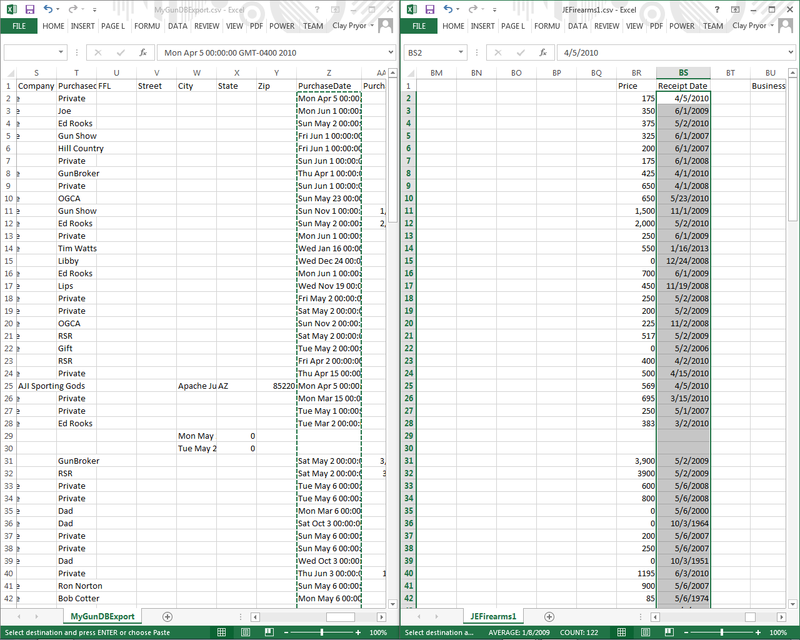 If you want a different order it is best to change the order in the spreadsheet before you import them. 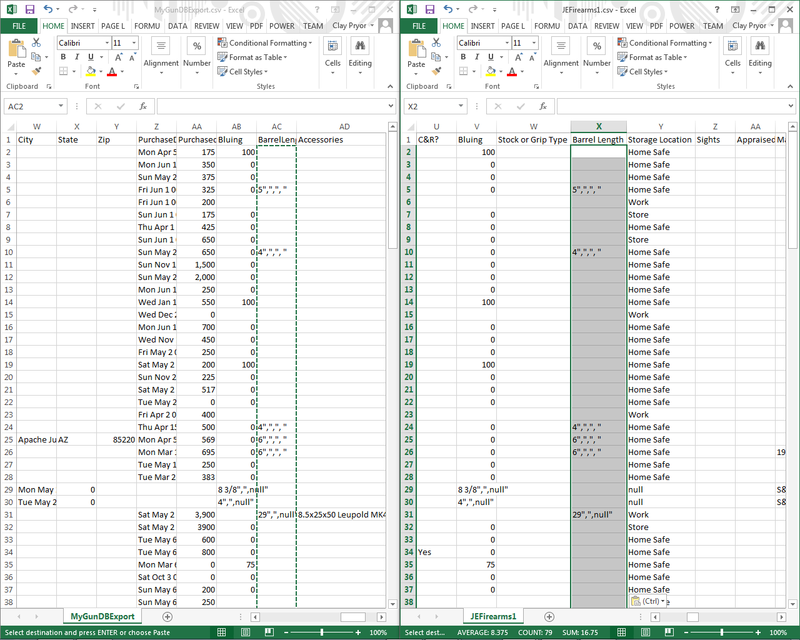 Serial numbers are blocked to protect the privacy of the owner of the data who gave me permission to use his data as an example of how to do this. Start with a fresh copy of NM Collector Software. First, we need to add any new fields that may be required. In this case we add Bluing, Barrel Length, Sights, and Manufactured fields in MyGunDB to the Description tab in NM Collector Software. 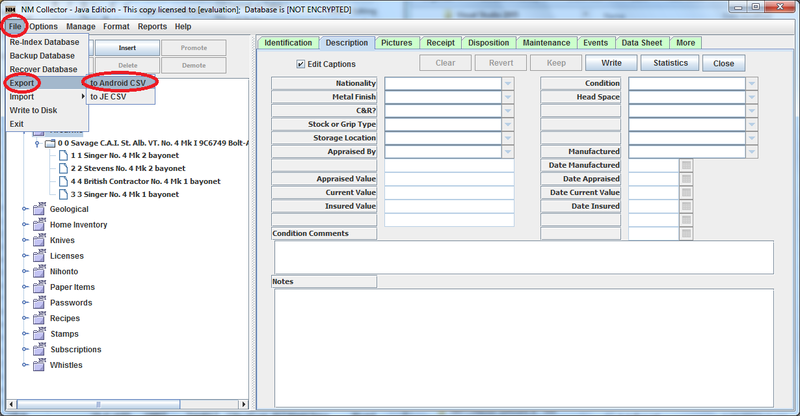 Next we will add "Accessories" to the "Notes" section of the "More" tab of NM Collector Software. 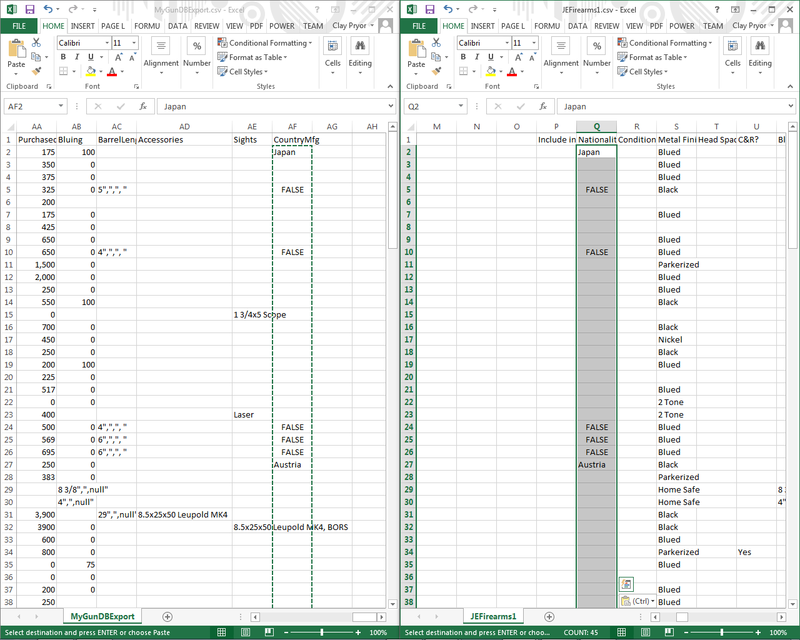 Now that we have the additional fields that we need to import into NM Collector Software, we will export the sample data from NM Collector Software to the JE formatted .csv (Excel) file. 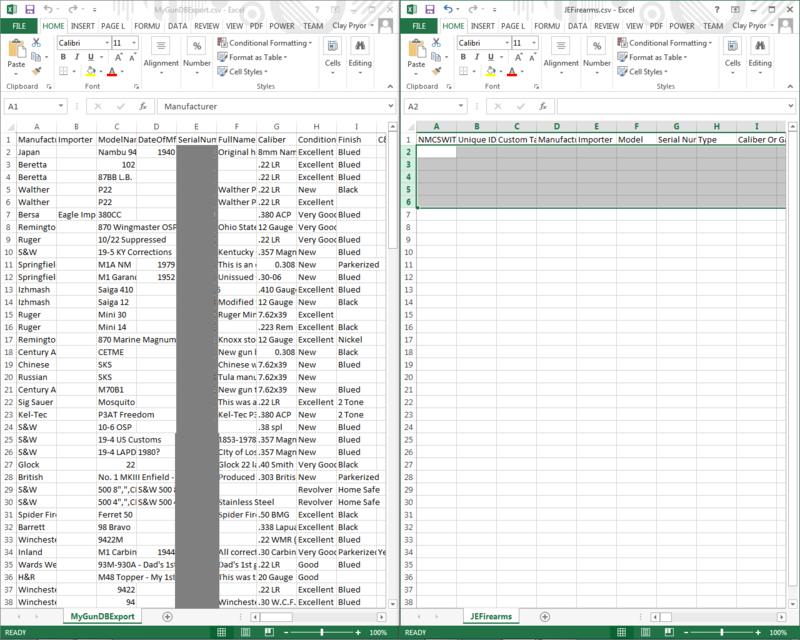 This will give us something to work with when reformatting the spreadsheet data to the NM Collector Software expected format. 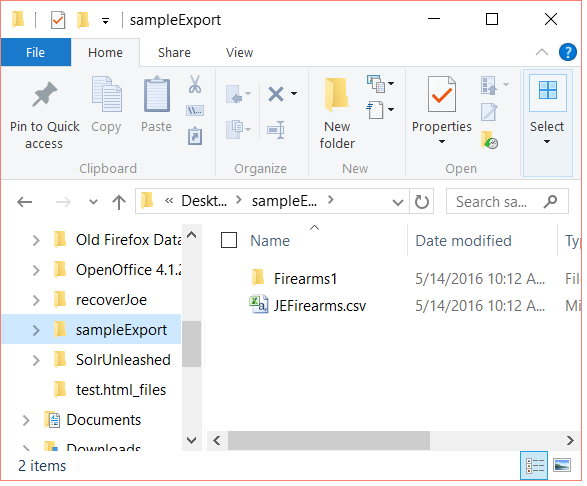 The name of the exported file is JEFirearms.csv. 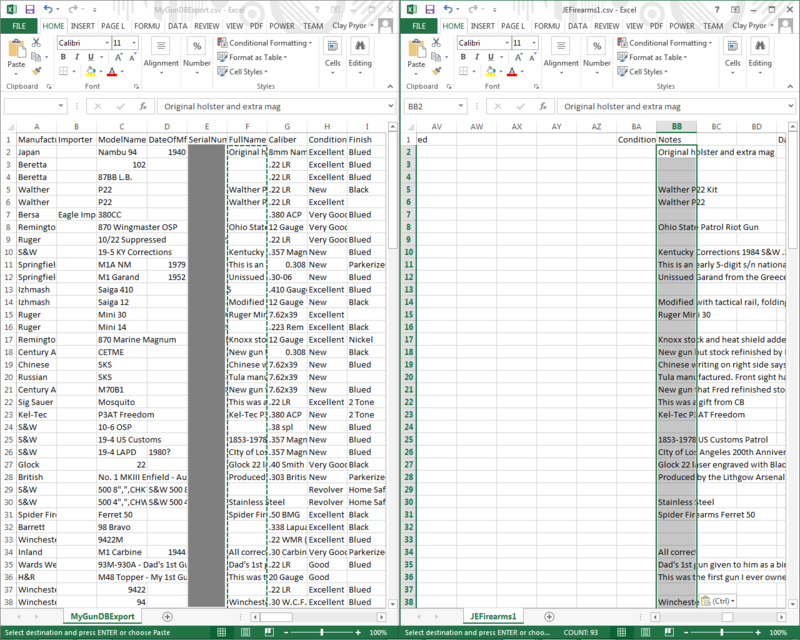 I made a copy of this file and named it JEFirearms1.csv so that I would not lose my changes in case I had to re-export my NM Collector Software data. 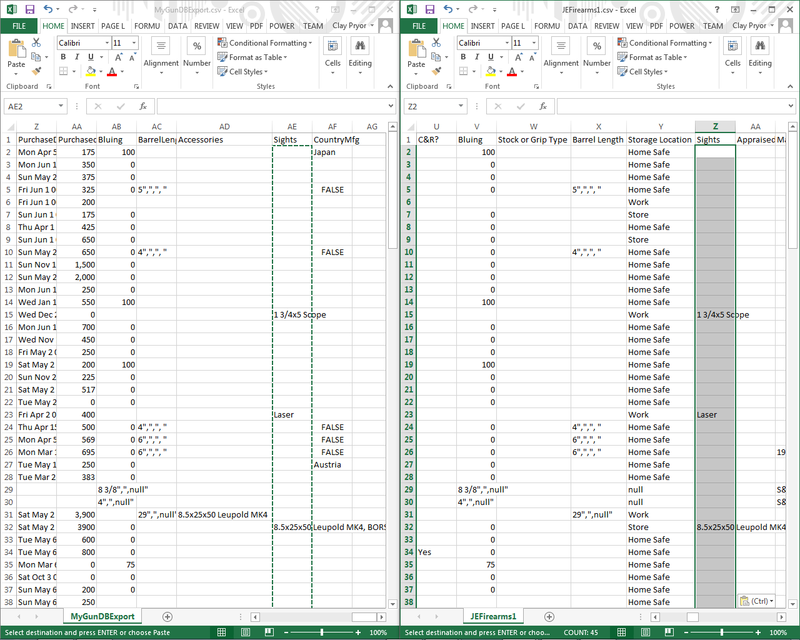 Next, we will delete the sample data that comes with NM Collector Software. 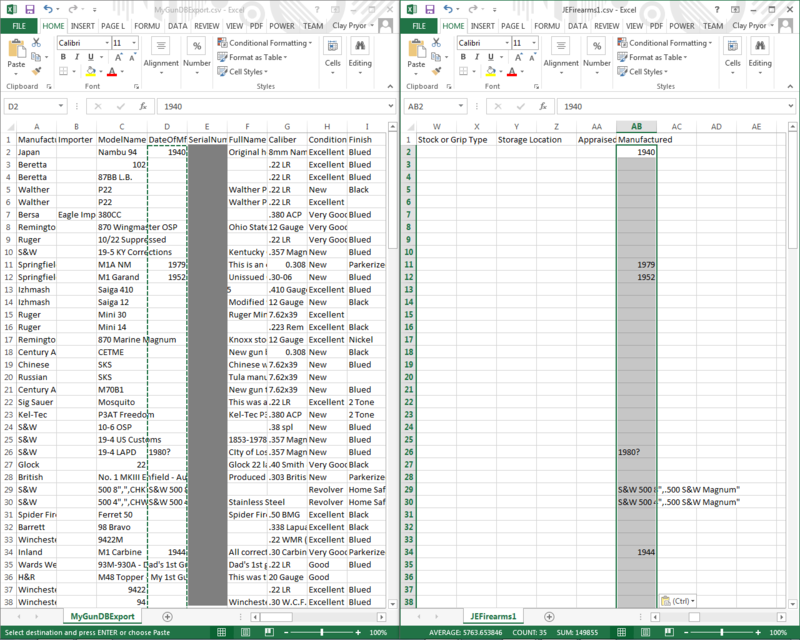 Now we turn our attention to the .csv (Excel) files where we will actually copy and reformat the data from the source spreadsheet to NM Collector Software (JEFirearms1.csv). 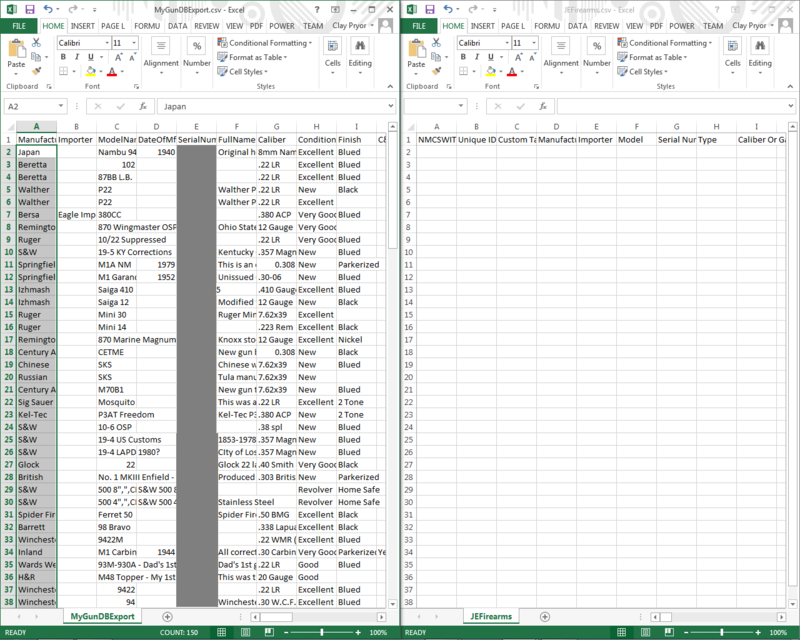 First, delete the sample data from JEFirearms1.csv. 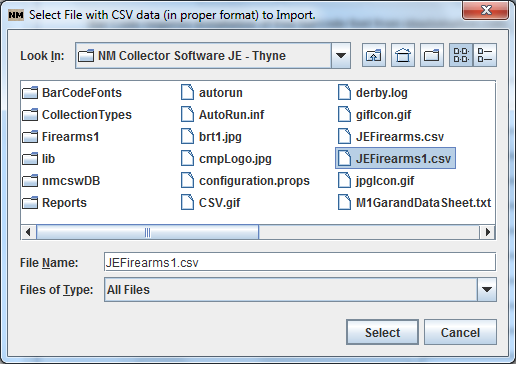 Click in the first cell in the appropriate column of JEFirearms.csv (just below the heading) to select the cell, then right click the cell and select "Paste" to paste all of the copied data into the NM Collector Software import file. 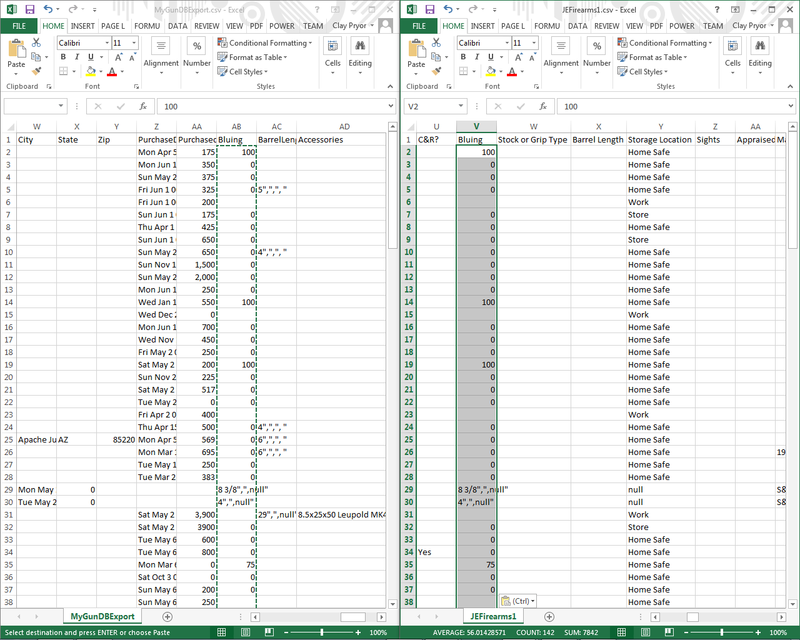 Repeat this process for all of the data that you want to import from your spreadsheet into NM Collector Software. 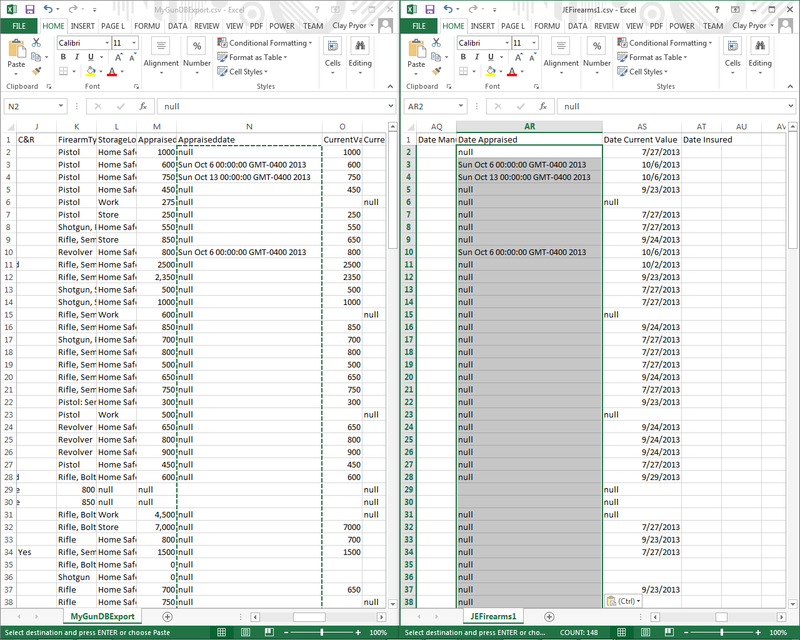 Depending on the date format used in the source data, the dates may have to be reformatted to properly import into NM Collector Software. Please see screen captures below for details. 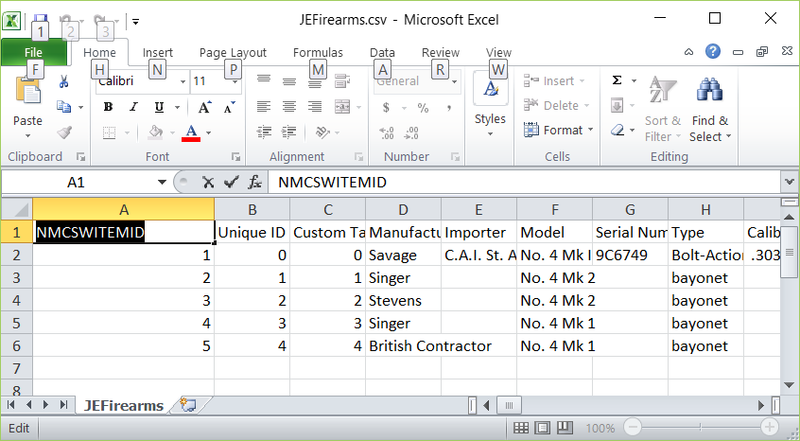 Then select the JEFirearms1.csv that you just updated. With a little more work, you can bring the pictures over. 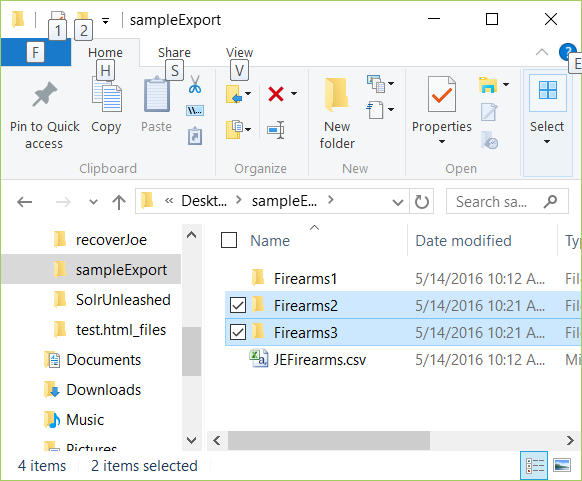 When you exported the sample data to get your csv format you might have noticed that there is a folder named Firearms1 in the same directory as your exported file. 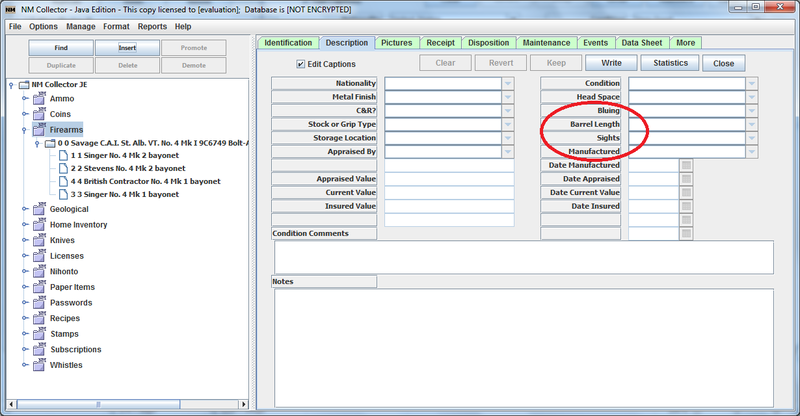 This folder contains the pictures for the item 1 in your csv file with the value of 1 in the NMCSWITEMID column. I do not know how you will get your pictures from My Gun DB but I am assuming that they are exported somehow. So, this is how you can import those pictures into NM Collector. Please see screen captures below. 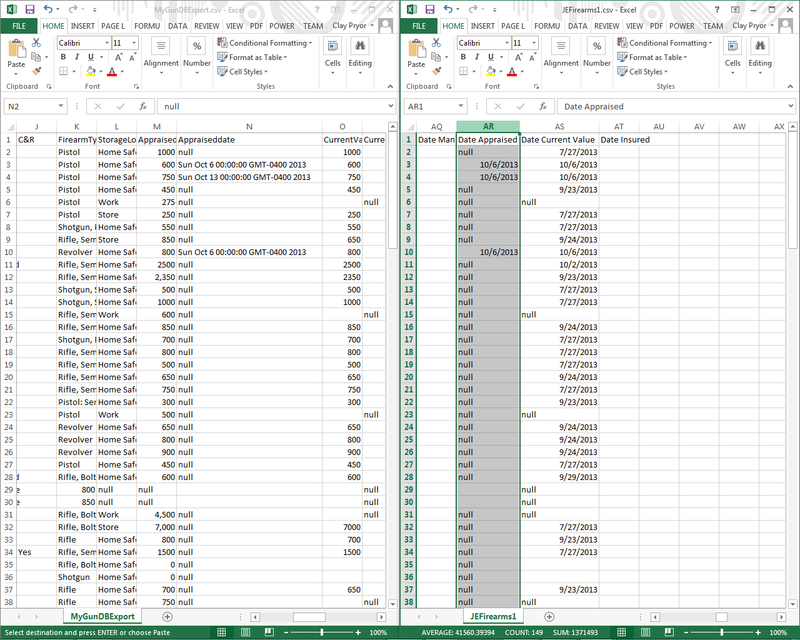 When you manipulate the csv file to import data into NM Collector, make sure you add unique (please, no duplicates!) 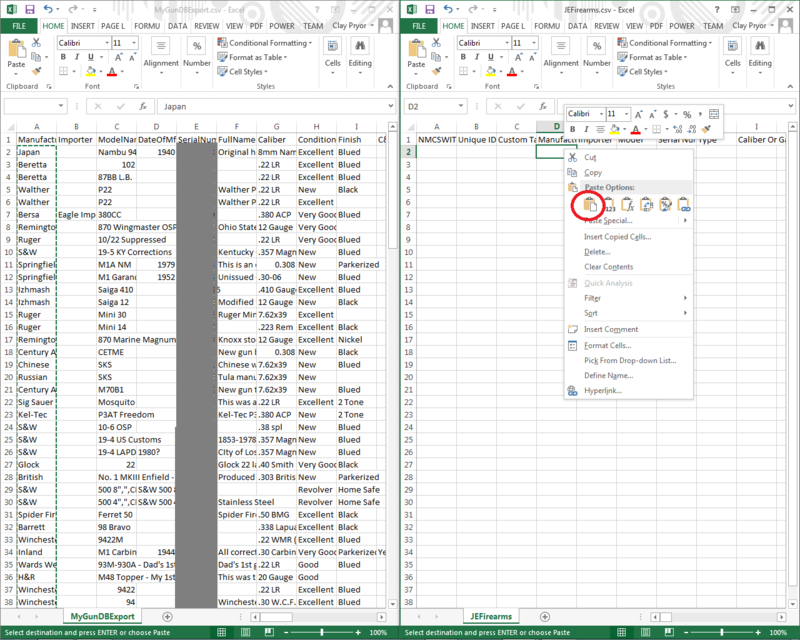 sequential numbers in the NMCSWITEMID column. 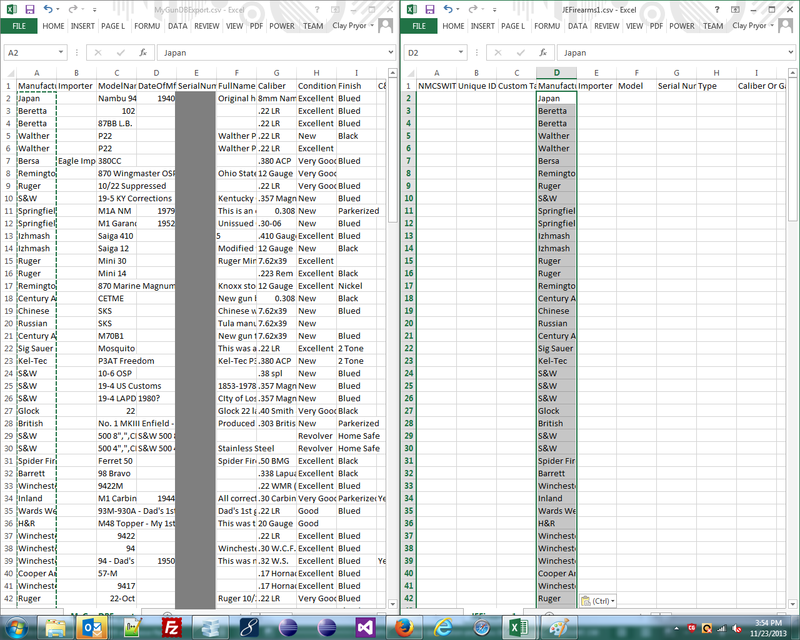 Then, add a folder containing pictures of each item in the same directory as your csv file. 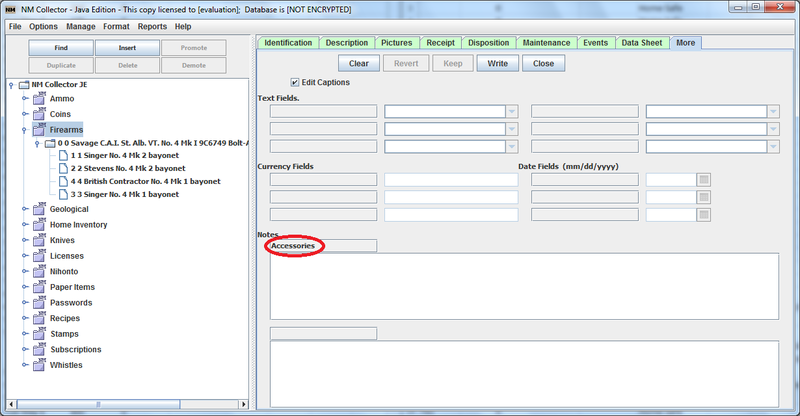 Name the folder according to the NMCSWITEMID in your csv file. So, if your gun with an item number of 3 has pictures, create a folder named Firearms3 and put your pictures for that item in that folder. This will import your data into NM Collector Software. Copyright © 2008, 2009, 2010, 2011, 2012, 2013, 2014, 2015, 2016 by nmCollector.net LLC. All rights reserved.